Cut brisket into 2-inch cubes and place in a large bowl. In a small bowl, combine salt, black pepper and cayenne pepper. Sprinkle seasoning over brisket and toss together. In a large heavy skillet heat oil. Add brisket in batches browning evenly (about 8 to 10 minutes). Transfer brisket to a large roasting pan lined with foil (to ease with cleanup). Add beer to the skillet and simmer for 2 minutes stirring to loosen browned bits. Pour mixture over the brisket and cover. Cook in preheated oven until brisket is tender enough to cut with a fork. Let cool slightly. Spoon batches of brisket onto a cutting board and shred with two forks. Add shredded beef to a large saucepan or (2) 13 x 9-inch foil lined pans. Skim visible fat from the juices and add 2 cups to the shredded beef. Cover and keep warm. In a medium saucepan, combine ketchup, water, vinegar, Worcestershire sauce, brown sugar, chili powder and paprika. Heat through and add 1 cup to the shredded beef stirring to combine. Split baguettes in half and toast. 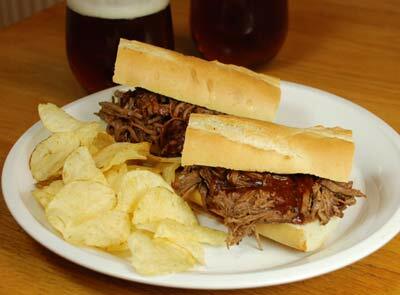 Spoon shredded beef onto bottom half of baguette and add barbecue sauce. Top with remaining half of baguette. Cut into desired length and serve with additional barbecue sauce.